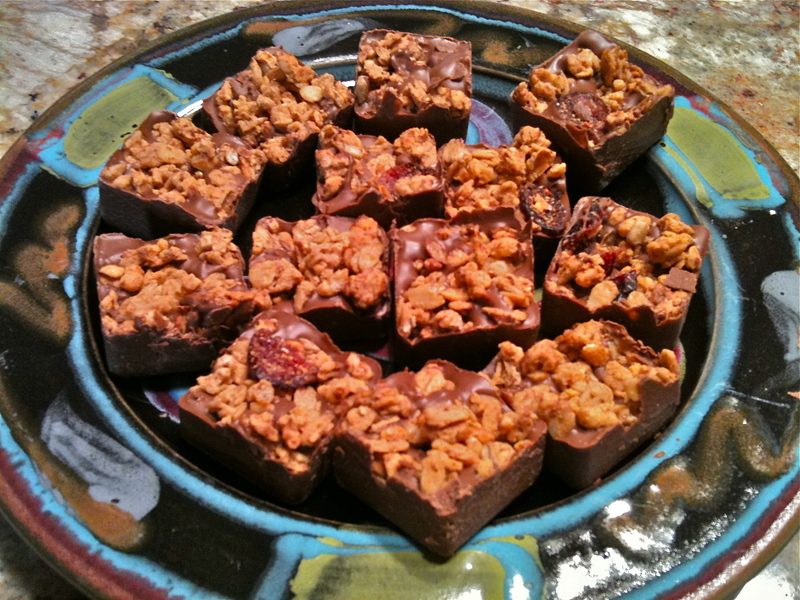 The Amateur Chocolatier | YOU can make fantastic chocolate treats! This first photo has delighted my heart. I have not come up with a line of “sushi chocolates” yet. But, I would love to! You can see in this photo that the main ingredients in this fun food is marshmallows, donuts, fruit roll-ups, and swedish fish. This is not the kind of thing I have in mind. I have simultaneously been inspired by Vosges Chocolat. This lovely candy bar on the right has a hint of ginger and wasabi, and black sesame seeds. I spent some time looking at photos of real sushi. I would love to come up with a line of candy with asian flavors, which have a sushi look to them. In the end I’ll probably keep the swedish fish. I can’t resist the way it looks! I was also thinking of keeping the marshmallows. Some other ingredients are sure to be ginger, wasabi, matcha, pretzel fish, sesame seeds… possibly a soy sauce caramel. Coconut will have an appealing look… to imitate rice. I have considered getting a fish shaped chocolate mold. I can only find really cheap plastic varieties at this time. This will be a fun adventure when I get to it. I don’t typically eat sushi, so this is more of a creative experiment. I don’t really know how to use asian spices well. Stay tuned! 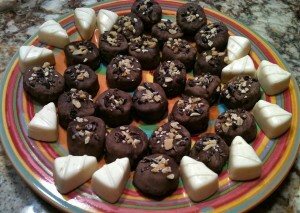 Three cheers for my 1st attempt at making truffles! Oh Joy! This was not as hard as I thought it would be. Bring cream to simmer. Drop in chopped chocolate. 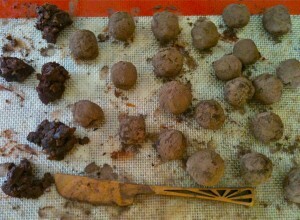 Let sit… stir gently… form into balls… roll in cocoa, or dip in covering chocolate. Done. I was going to make a black & white truffle, using both the white chocolate and the dark chocolate in the same balls. I changed my mind and made them each into separate types. This was fun! I was so encouraged by my first try at truffles. I played it very straight. Followed the recipe. But now? I just might get a little more confident and try some improvisation. 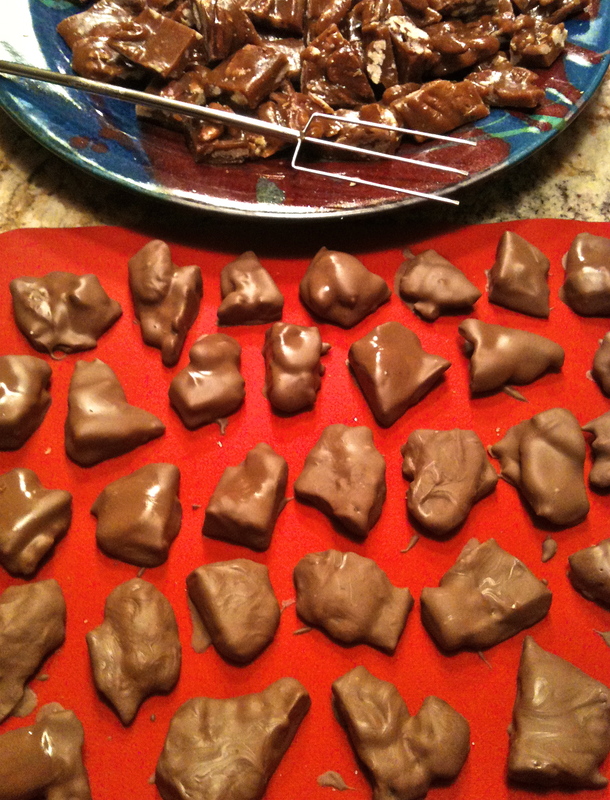 It seems pretty easy to make truffles. Time for adventure. 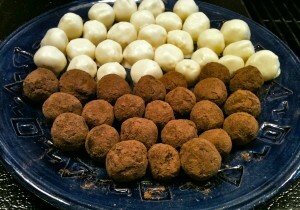 I am dreaming of hazelnut & milk chocolate truffles. Also a salt & lime truffle, to remind one of a margarita. I found a great price on good quality bulk chocolate. I ordered it. It came. 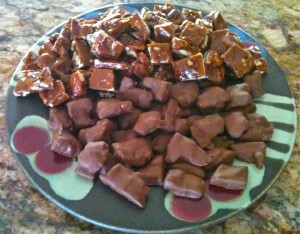 You are looking at 20 pounds of chocolate! Oh, the fun that I will have with these boxes! A 72% dark chocolate & a 38% milk chocolate. It is almost like a painter having a blank canvas. Where to start? I would like to make truffles. But, they are a 2 day project, so I’ll have to leave them for next week. Hmmnnn…. I’ve been making these for years. I think they are such a cute candy. A mix of sweet and sour. I cut strawberry marshmallows in half. I dip them in white chocolate. I have found that enrobing chocolate makes for a prettier dipped piece. (Smaller foot, smoother shape.) Then I sprinkle lemon-aide mix onto the top of the chocolate while it is still liquid. The lemon-aide mix is sour, the marshmallow and white chocolate is sweet. Fun, cute, sweet! I’ll definitely keep these in my recipe list – as is! No adaptations needed! This is the best mistake I ever made! I had been shooting for a chewy caramel. I was making the caramel while I was cooking dinner. Next thing I knew, my temperature was too high. I was afraid I would have to throw the whole thing out. In a moment of lucid thought, I looked at my thermometer cover and learned that 275 degree goop would be good for a brittle. So I grabbed a bag of pecans and stirred it into the mix, poured it onto a silpat, and chopped the slab into bite sized pieces before it got too hard. 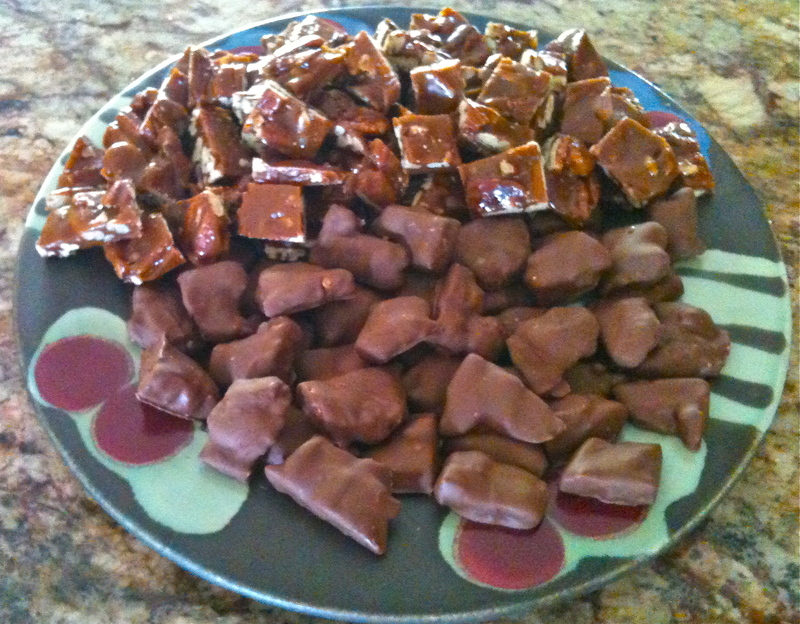 The result was mind blowing pecan brittle, ready to dip into chocolate. Yippie! The dark chocolate was the most popular. But my favorite was the cayenne milk chocolate that you see in this photo. When I was in Peace Corps in Niger, West Africa, there was not a lot of candy to be had. As grace would have it, I had a handy dandy Peace Corps cook book. It was made especially for people living in sparse conditions… like me! 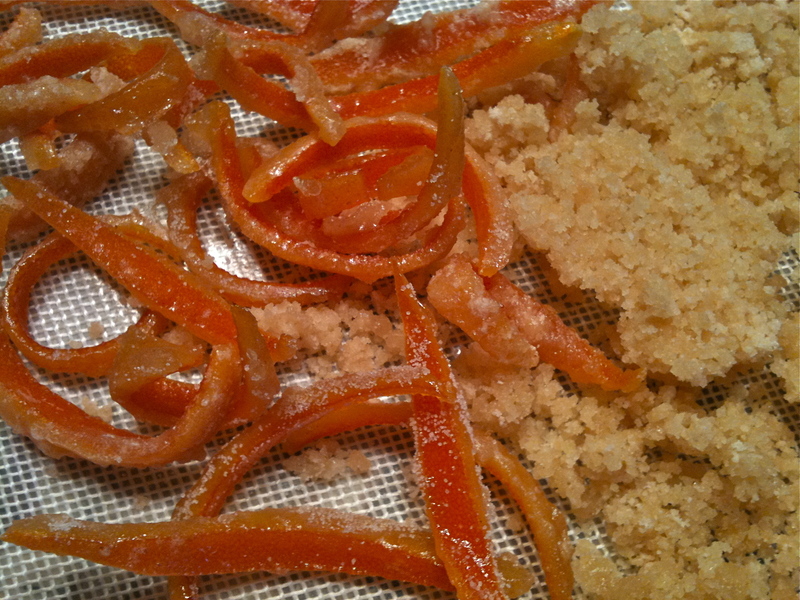 I noticed that candied orange peels might satisfy my sweet tooth. Plus it only require 2 ingredients: orange peels and sugar. Nice! I can’t find my Peace Corps cook book! No! So Sad! But I looked online to find a candied orange peel recipe. I found a bunch of them… all of them quite different. I combined the general ideas to make up my own recipe. The basic idea is to cut the peel into strips and remove most of the white part of the peel. Then boil the peel in water for about 10 minutes…then throw out that water. The take 2 parts sugar to 1 part water and slow boil that with the peel in in until the mixture gets syrupy. (I added about a teaspoon or 2 of ginger powder to this.) Take the peel out of the syrup and let it cool. Toss the peel in sugar, and let it dry for a while. I couldn’t see letting the remaining ginger orange sugar go to waste. So, I continued to cook the mixture until it turned to crystals again. I poured this onto a silpat. I guess I’ll crunch it up and save it to sprinkle on something in the future. OK – that’s done. 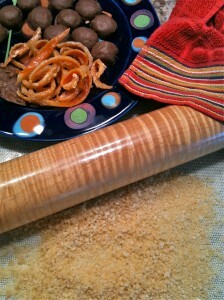 I got out my gorgeous flamed maple hand-crafted rolling pin. I don’t get to use that too often. So, here we have the ginger orange sugar crumble, candied orange peel, and some chunky almond butter enrobed in milk chocolate. I don’t really know what to call this experiment. I haven’t really tasted it yet, just licked the spatula at the end. I ground up jasmine pearls into a fine powder and then mixed them into a dark enrobing chocolate. 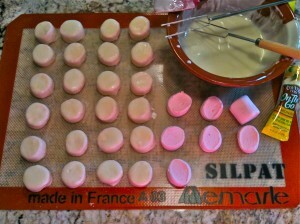 I cut marshmallows in half and dipped them into the melted mixture. Then I sprinkled finely diced walnuts and organic nibs on the top. I was disappointed that the chocolate got a little hazy white after it set up. I have to read up on this. It wasn’t a chocolate that required tempering. The white chocolate has a hot cinnamon flavoring oil and pop rocks in the mix. They are creamy with a crunchy pop finish. I wish I had added more pop rocks. It is too subtle for my liking! Rebecca was right about trying a lot of things and taking good notes. I am learning as I go! OK – I have gotten a good taste of these now, the next day. I am very pleased with te flavor. I had been concerned that the jasmine would be overpowering. I seem to have gotten the right amount… maybe the recipe could even take a little bit more. Brook said it was subtle. The jasmine really hit as an aftertaste. I thought that the nibs would be the finishing flavor, but the jasmine lingered quite pleasantly. The marshmallow was mostly there to make the piece bigger… to puff up the size of the candy, and thin out the jasmine. This recipe could very well be a keeper. I will probably do some more experiments with jasmine, too. 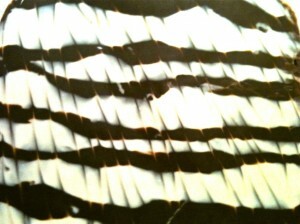 I’ve wanted to make a dark & white chocolate slab to call Zebra chocolate. This was my first attempt. It is interesting to look at, but not what I was going for. I think I can do better. I’ll have to develop a different technique. Maybe using a pastry bag? I should probably look at some photos of zebras! I don’t know if I will (eventually) make it a flavored concoction, or not. Maybe just getting really contrasting chocolates would be enough. I have been researching affordable chocolates today. I did order some more Bada Bing Bada Boom chocolate because it is tastie and easy to work with. But, it is a compound chocolate. I’d also like to get more familiar with what I am tempted to call “real” chocolate. The difference is that what I am calling real chocolate has cocoa butter in it. 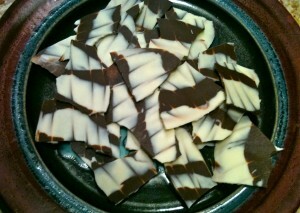 It is the cocoa butter that makes tempering chocolate so tricky. That leads me back to the BadaBing… which requires no tempering. BUT, there is a subtle depth of flavor that comes with the cocoa butter. Without doing taste tests, most of my recipe testing audience won’t ever know the difference. I have been taste testing. 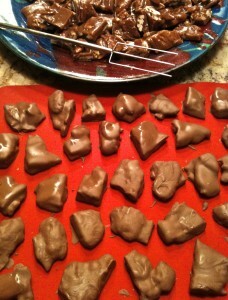 So, I know that the real chocolate will be worth the extra effort once I get more comfortable with my recipes and other chocolate techniques. Anyway, I found a good source for “real” chocolate today. I am so excited. Some of the reasons I am so enthusiastic about this source is that: (1) Their prices are great. (2)They are made in America. (3) They are also recommended by the author of one of my favorite chocolate books (Making Artisan Chocolates, by Andrew Garrison Shotts). (4) They sound like their flavor profiles will go well with the crazy ingredients I like to mix with my recipes. Shotts led me to a website with the best price on 10 pound blocks of chocolate: chocolateman.net. The prices were great, but the descriptions were sparse. I ended up on some other websites tracking down information about flavor profiles, chocolate viscosity, and % of cocoa in each blend. But the part of my search that gave my heart the biggest burst was (5) the story behind my new favorite chocolate manufacturer. Ha! I haven’t even tasted the chocolate yet! 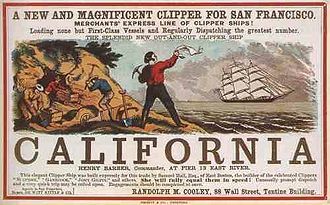 A guy named Etienne Guittard came to America to be a part of the California Gold Rush. He was an original 49er! He came to California with some chocolate to trade for mining supplies. He found that his real treasure was the chocolate. People went nuts for it! They would trade gold for chocolate! YUP! Like that is a surprise! He went back to France and saved enough money to travel back to San Francisco and start his own chocolate factory. 150+ years later, the company is still in the family. Today Gary Guittard is following the latest trends in the trade. 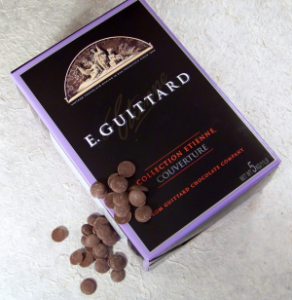 Chips, couvertures, single origin chocolates… Gary is on top of his trade. Chefs from around the world are endorsing this American made chocolate. 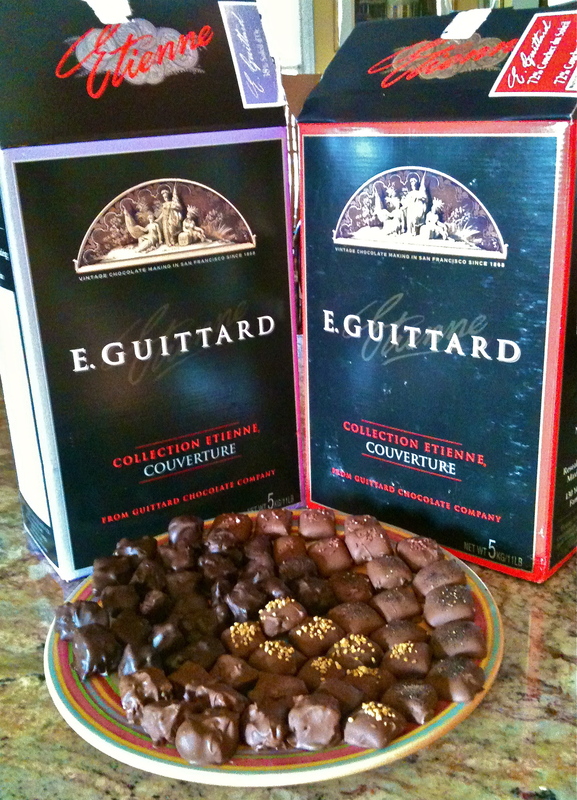 About Guittard. I can’t wait to buy some “real” chocolate from Guittard. I just can’t decide if I want to get 2 pound chunks of a bigger variety at a higher price, or 10 pound bars of fewer varieties, at a significantly better price. It would be fun to try more variety. I can’t resist good prices. Which part of my personality will win this round of decision making?